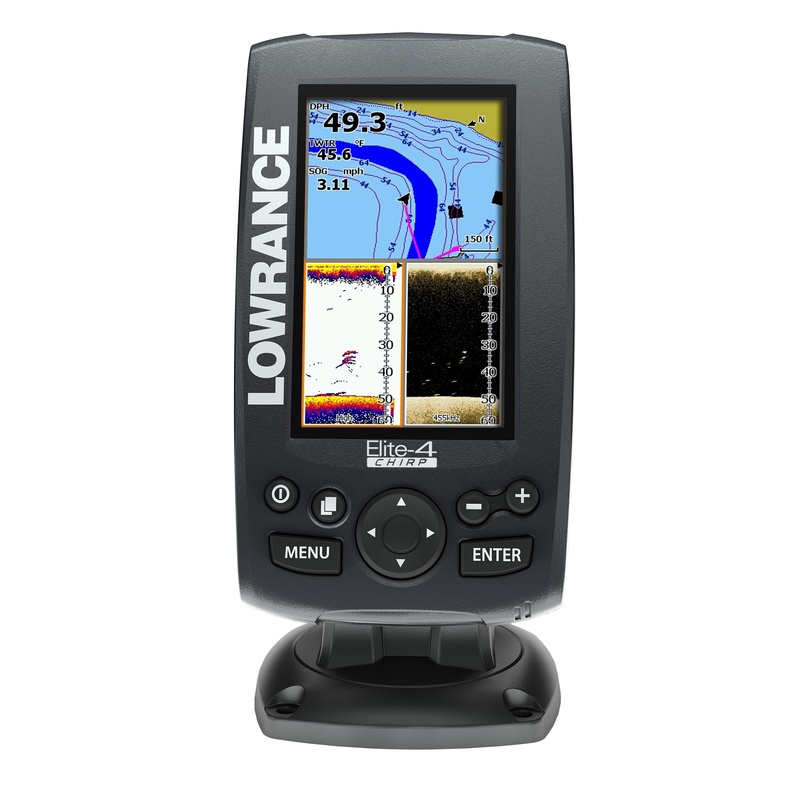 Lowrance Elite 4 CHIRP has an average rating of 4.22 out of 5 based on 9 user reviews. Lowrance recently announced the addition of the affordable Elite-4 CHIRP series of fishfinders to the company’s lineup. The Elite 4 CHIRP comes equipped with all of the bells and whistles of the Elite-4 HDI series with the addition of CHIRP that emits a modulated pulse via the transducer. Instead of emitting a single 50 or 200 kHz pulse that bounces off objects and returns at the same frequency, CHIRP pings pass through the water at different frequencies ranging from 28 to 60 kHz, 42 to 65 kHz or 130 to 210 kHz. In this way, regardless of the distance of the targets, pings return at different frequencies, which effectively separates even the smallest objects and provides greater image detail. Using a single transducer, anglers have the option of changing the CHIRP settings with pings ranging from low to high. Set on the lowest frequency, the sonar illustrates bait and game fish at the deepest depths of the water column. Use a medium setting when attempting to locate bottom structures or fish. The high setting provides the clearest images in shallow or coastal waters. The detail produced makes it possible to watch the action around lures while distinguishing between bait balls and game fish. Images are also visible as the boat moves. Lowrance fishfinders also feature the down imaging that creates even crisper images of what actually lies beneath the boat using high frequency sonar. DownScan creates photograph-like 3D images of fish, vegetation and solid structures, which takes the mystery out of animate and inanimate objects. By applying the Overlay option, anglers can also combine DownScan images with CHIRP sonar to form a single view. Elite 4 CHIRP features a 4.3-inch screen that provides color images in high definition. See water depth, temperature and boat speed via large on-screen digits. The on/off, menu, page, zoom and directional buttons on the front of the device make the unit user-friendly right out of the box. Once powered on, anglers merely choose from a series of pre-set page layouts ranging from single to triple split screen views. Look at maps while getting CHIRP or DownScan images at the same time. The TrackBack feature scrolls stored images backwards to reassess particular structures or locations. The map feature provides information on more than 3,000 lakes and rivers in the United States along with coastal contours. The micro SD card slot is suitable for using a variety of plug-and-play maps. Or, use a blank card to keep plotted way-points. The Insight Genesis technology allows anglers to go online and create customized maps using recorded information. Simply upload data to a no cost account, view the desired chart, make the needed adjustments and download the data to the SD card. You can get a great deal on Lowrance Elite 4 CHIRP here. Posted by Jeffery Davis Jr. This unit is very accurate and for both sonar and GPS. The screen is bright and easily readable, I like the fact that they made the screen bigger than the DSI version. I also like the new mounting bracket for the head unit, it tilts and swivels. The menus are a bit confusing at times but that’s probably because they packed so many features into this little unit, it has almost all the features available on the high-end models. If you have a Hobbie kayak this is the fishfinder for you. The kayaks are made to fit Lowrance mounts. This is unit is small but it has all the features of the big fishfinders, it’s actually amazing how much technology comes with this compact fishfinder. I use it to explore shipwrecks in the ocean shore but it’s also great for finding fish. It uses very little power so it’s a perfect unit for a kayak. Quality unit with a nice, clear screen that actually much larger than compact units from other manufacturers, this is almost as good as 5” units. I don’t use the split mode because the display becomes too small for me, but I can switch quickly between screens and I can display both sonar and downscan at the same time using the overlay. I can reach 400′ depth using the 83kHz frequency. I’m very happy with this purchase. Installation was a breeze, just 2 cables – power and transducer. The unit is very readable even in the sun, the sonar is very sensitive and accurate. I had dial mine down, I was getting too much detail in the display. When you decide to buy one of these, make sure you’re getting the right version. There are units, with and without maps, with deepwater and regular transducers, some have Navionics Gold maps included, some don’t. I got this as a Christmas gift from the wife and loved it from the start. For the first few months I took it out on the weekends scanning lakes and marking spots on the GPS. The GPS is quite accurate and picks up satellite lock quickly. Now that it has warmed up, I have finally had a chance to try out the sonar. The down imaging works great. I was picking up crappie pods clearly while drifting in 8 feet of water. The side imaging can be a little hard to read on the small screen form time to time but works as advertised. The landscape orientation really helps offset the smaller size more than I expected. Overall this is a great product for the money. Most units with similar features will run a few hundred dollars more. I got it as a gift but would buy it myself in a heartbeat. Like all the new Lowrance fishfinders, Its a super easy to use fish finder. With CHIRP sonar being brought in this year it is the best fish finder you can get for that price. Had the lowrance Elite 4xhdi and system crashed. Still under warranty (1 year) so I took it to Bass Pro and the techs diagnosed it was ducer or the unit. Gladly replaced with the new Elite 4x CHIRP and I couldn’t be more thrilled. With color selection changes for DSI or sonar, sensitivity adjustments and a few other tweeks that I discovered, this thing rocks on my FS10 kayak. Easy to read and after a few trips on the water anyone can read, understand and find baitfish, schools of sand Bass, and large mouths. Easy install and amperage draw is less than 1 amp per hour. I use a 12volt 10amp hr deer feeder battery and can fish for three days running 6-8 hours a day on one charge. 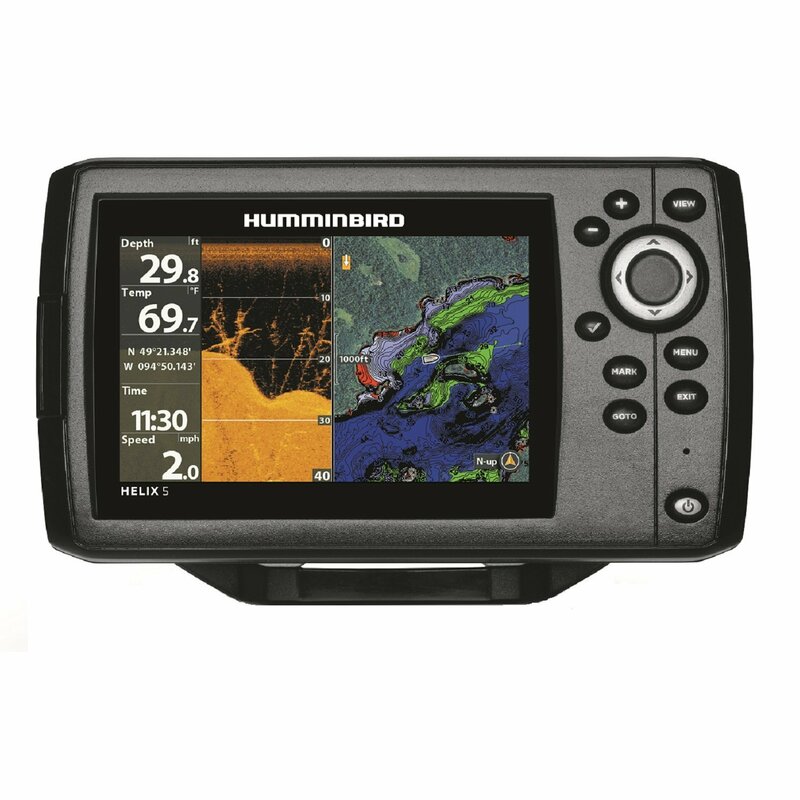 I must have for any fisherman who wants to fish more, fund and locate fish and have the versatility to run auto configuration or manual settings changes with minimal effort. I use the thru hull mount and have tested both side mount and the thru mount options and see no degradation of sonar or DSI. Following the lowrance install for thru hull mounting you will have no problem with surface temperature, depth and fish locating. Just finished installing the elite 4-chirp. It hasn’t been used on the water but the unit got stuck and it won’t go to functional screen after I powered it up. I spent 31 minutes with the tech support on the phone the unit finally started working after a few resets. Hopefully I won’t have to do that again when I’m on the lake. Got my elite 4 chirp last year at Wal-Mart & all info on & in box detailed navionics, & mapping but i cant get any of that … guess i gotta have a different transducer or something. Although, it works great it would be nice to have the other also.